Situation Coilcraft specialise in the manufacture of components for electronic circuit boards. The company introduced a telephone order line for component orders of less than 50,000 units to meet the demand for low volume orders. 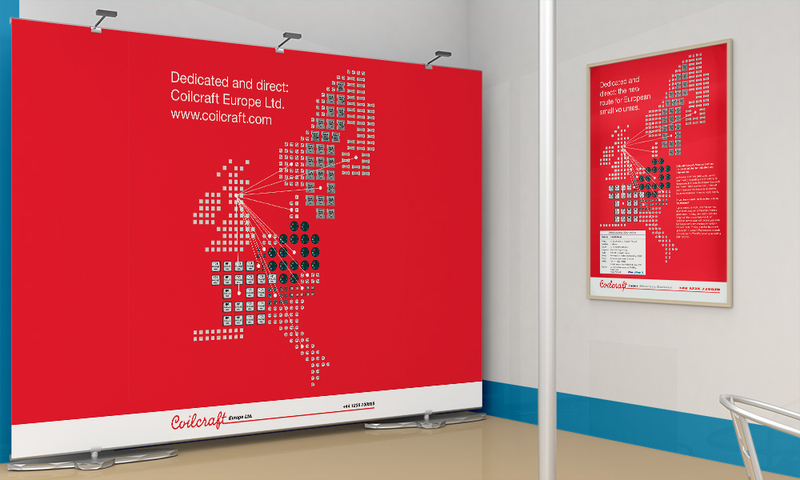 Task Coilcraft wanted to promote their new direct ordering service throughout Europe. Since the adverts were to appear in local trade magazines throughout Europe (with translated copy) imagery had to unambiguous, simple and direct. Action The Nth Degree created the map of Europe image using Coilcraft’s components, advert style and copywriting for the English versions. The image as also applied to an exhibition system. The information about how to order was presented very clearly. A dedicated phone number and agents ensured that orders are processed efficiently and quickly. Results Advertising campaign resulted in significant orders from a previously untapped market segment. Exhibiting at trade conferences created further awareness about the service. Call 0131 618 2999 to discuss how we help make the most of your next exhibition.